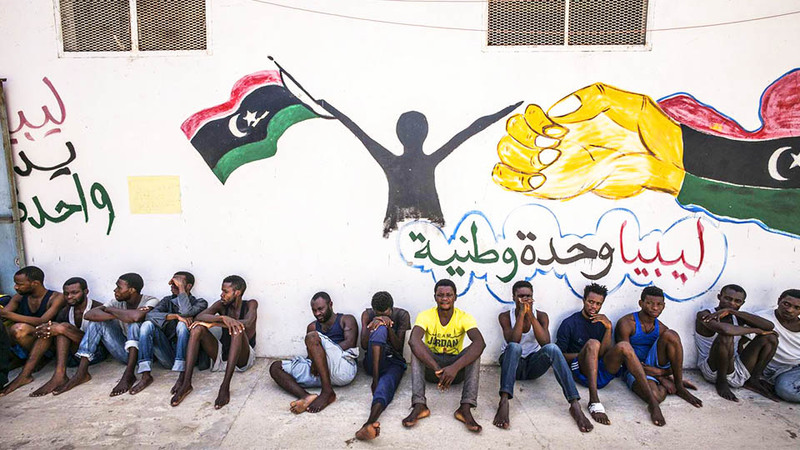 In July 2018, two Human Rights Watch researchers visited four detention centres in Tripoli, Misurata and Zuwara, Libya. They documented the inhuman conditions in which thousands of people are held. Severe overcrowding, poor hygiene, poor food and water quality resulting in malnutrition, poor health care, violence suffered by guards, including beatings, lashes and the use of electric shocks. All their work and interviews were used for the report No escape from hell, published by Human Rights Watch in April 2019. Since the end of 2017, two UN agencies, UNHCR and the International Organization for Migration (IOM), have accelerated EU-funded programmes to offer migrants the possibility of safe departure from Libya, a country without any refugee law or asylum system. By the end of November 2018, the High Commissioner had evacuated 2,069 asylum seekers and moved them to the Niamey transit centre in Niger, awaiting refugee status and eventually resettlement in Europe or other countries. However, this was in conflict with the limited capacity and mandate of the UNHCR in Libya and the gap between the number of places available in the host countries and the number of refugees who should benefit from them. In November 2018, a further 312 people were sent directly to Italy and 95 to an emergency transit centre in Romania. Between January 2017 and November 2018, the IOM helped more than 30,000 people to leave Libya to return to their country of origin with its “humanitarian voluntary return programme”. Although it is a valuable aid for migrants who do not need international protection and wish to return home safely, this programme cannot be described as truly voluntary, because the only alternatives available are the prospect of indefinite and violent detention in Libya, or a dangerous and costly crossing of the Mediterranean. Despite these activities, the increasing number of boats intercepted by Libyan coastguards with EU support has led to an increase in the number of inmates in detention centres. In the period covered by our research, July 2018, there were about 8-10,000 people in the official centres, compared to 5,200 in April 2018. There are also minors in the centres. Since 2016, the European Union has increasingly funded the implementation of the Libyan ‘system’, to strengthen its institutions, the ability to manage flows by preventing departure and accepting returns. At the same, there is a harsh media campaign – led not only by some EU governments – towards NGOs trying to rescue at sea. Detention in centres in Libya is arbitrary and does not meet any standards of international law, such as rejecting people to a country in which they are victims of trafficking, violence and violation of their rights and in which there are, daily episodes of armed conflict.